In this contemporary setting, we discover the importance of fam and what happens when you dark the boss man. 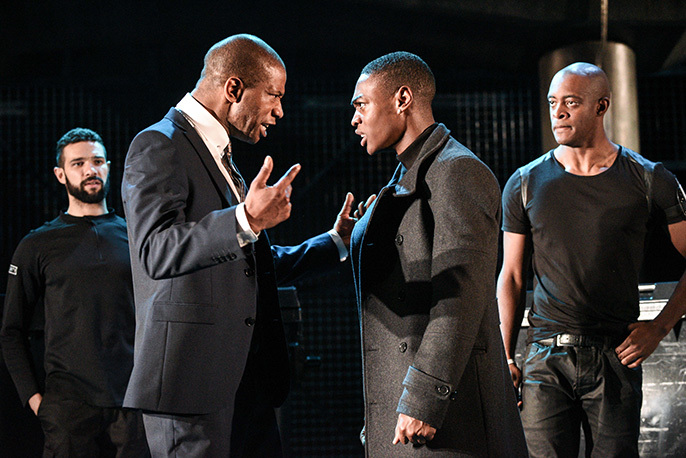 With lashings of London slang and digital effects Roy Williams has catapulted Antigone, spitting and swearing into the 21st century. By supplanting Thebes in an urban landscape the abiding issues of loyalty, vengeance and honour gain a potent relatability. New king of Thebes, Creo has decreed that the body of his enemy, Orrin will be left to rot on the battlefield. Antigone (or Tig as she prefers) defies Creo and covers her brother’s body. Her act of rebellion is caught on a soldier’s smartphone and Creo sentences the ‘wurtless sket’ to death. In true Grecian style, Tig’s plight sends ripples through the city and a whole heap of chat from the peeps. Creo’s son Eamon strives for democracy and must confront his father to save his beloved. In this contemporary setting, we discover the importance of fam and what happens when you dark the boss man. Directed by Marcus Romer this charged production bristles with an unrepressed energy. Savannah Gordon-Liburd plays Tig and combines moral integrity with sassiness wonderfully. Her virginal garb of a white dress gives a little nod to the play’s traditional format. Designer Joanna Scotcher has created a smoky and foreboding industrial set. An ingenious touch is the dumpster which transforms into a velvet covered booth. This is Creo’s throne; emblematic of Al Pacino in Scarface Mark Monero plays the tyrant with pure ego. Monero is mesmerising in this role; aggressive and menacing, he slips from London dipthongs to Caribbean patios. The use of multicultural London English as the lingua franca was a brave decision of Williams. It adds a forceful freshness to interactions, but at times it can feel a little too deliberate. There is a post-apocalyptic feel to this production, enhanced by the steel gates and strong military presence. Three soldiers flank Creo and do his bidding. Soldier 3 is a cheeky braggart played by Sean Sagar who adds some slapstick to the proceedings. The camaraderie in the ranks is brilliant and the contemporary language embellishes the banter. Soldier 3 played by Oliver Wilson is perhaps the most subtle player of the cast. Sensing an eminent catastrophe he tries to warn Creo against such brutal ruling. His portrayal of despair and anxiety is heartfelt. Williams’ Antigone is a versatile and energetic piece of drama which welcomes a new generation of theatre goers with open arms. Although this piece is dialogue heavy, great emphasis is placed upon physicality; the play opening with a murder scene. Innovative projections of CCTV footage and oaths from a spectre-like Tig add dynamacy. Williams has stuck fairly rigidly to Sophocles’ storyline, this being the third in the Theban trilogy. As such the story is cumulative and old feuds are key. Issues of blood loyalty are also essential, with Creo being forced to choose between his reputation and his son. Gamba Cole plays Eamon; an idealistic young man in love. His frustrated anguish is portrayed with sensitivity and a genuine depth of emotion. His appeal to his mother Eunice played by Doreene Blackstock is achingly desperate. Blackstock is formidable as the protective, rags to riches queen, shrugging off Tig’s pleas as she examines her nails. Unusual for a Greek tragedy, there is a great deal of comedy in this play which comes from the witty retorts and sarcasm in Williams’ script. The onstage dynamics of the cast are strong throughout. This reimagining of a classic works well on most levels - by choosing a play with a teenage heroine, Williams has captured the high minded rebellion of youth and made it identifiable with the same generation. The underlying love story between Tig and Eamon is particularly moving and expressed touchingly by the two actors. The ancient system of sovereignty and references to Gods are not meant to be taken in their original meaning. But at times such grandiose matters don’t fully translate into a ganglord context. Despite a few shortcomings, the production was compelling and performances were uniformly excellent. 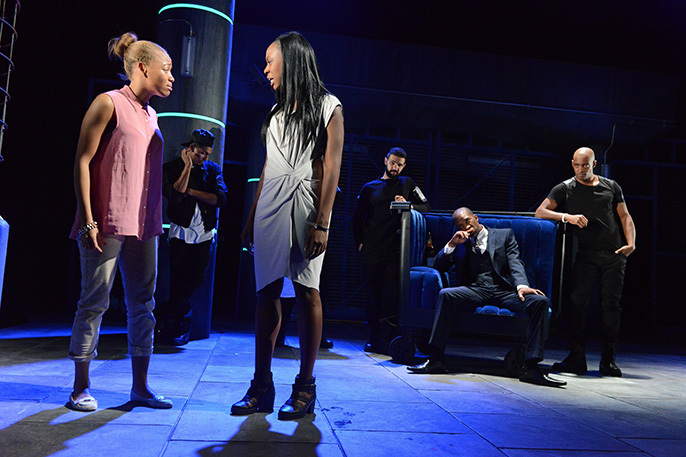 Williams’ Antigone is a versatile and energetic piece of drama, which welcomes a new generation of theatre goers with open arms.